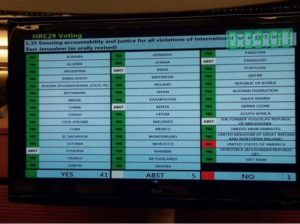 On 3 July 2015 the 47-member United Nations Human Rights Council voted to adopt a resolution condemning Israel over the findings of a UN report into the Operation Protective Edge in Gaza. 41 countries voted in favor of the resolution, while one country – the U.S. – voted against. 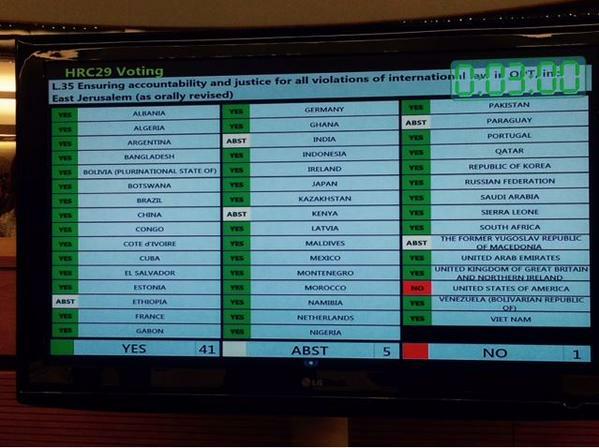 India, Kenya, Ethiopia, Paraguay and Macedonia abstained. The Council resolution entitled « Ensuring accountability and justice for all violations of international law in the Occupied Palestinian Territory, including East Jerusalem, » welcomes the report of the UN-established Commission of Inquiry on the 2014 Gaza Conflict (CoI) and calls on « all duty bearers and the United Nations bodies to pursue the implementation of all recommendations » of the report. The Council members also expressed grave concern “by reports regarding serious human rights violations and grave breaches of international humanitarian law, including possible war crimes”. The overwhelming support of 41 members of the Human Rights Council represents an encouraging step towards ending Israel’s impunity.